Belmar NJ might be small, but it is a cute and inviting waterfront destination that features plenty of things to do. Belmar is incorporated, and the borough in southeastern New Jersey is a favorite vacation spot of people that flock to the state each year. Not only can you enjoy all of the recreation available to you in the borough of Belmar, but there are also places of interest in nearby townships just a hop, skip and a jump away. You may want to take the car, but see if you can’t make it by all of these attractions in and around Belmar NJ. Allaire State Park is one of the places of interest that is technically located right outside of Belmar in Wall Township on Atlantic Avenue. You should see the old steam train, and there is a general store and bike trail, too. It is a little historical village, and the scene goes right along with the travel destination you have chosen, Belmar NJ. Of course you have to make some time for the beach itself while you are there, too. You can soak up the sun and enjoy the sand and the surf. There are also watersports and fishing excursions to enjoy as well. The Boardwalk is also nearby, and you can count on the beach there being in pristine condition according to the reviews. Belmar is on the oceanfront in southeastern New Jersey, so not making it to the beach would be a vacation faux pas indeed. Have you had the opportunity to go parasailing before? There is a reason why this is the #1 attraction in Belmar. Review after review, people talk about this adventure being an awesome experience, and so it comes strongly recommended. 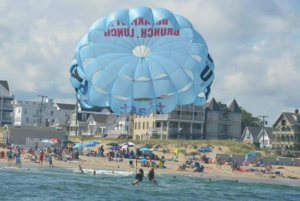 People also say that Belmar Parasail features friendly staff, and you can buy a photo package to commemorate your vacation experience. If you think about it, this adventure would be a great way to get a good look around at the entire Jersey Shore. Do you like the arts? This attraction will slow things down a little for you, just at the right time. Maybe you can visit the Sea Zen Art Gallery & Experience after lunch while your food is still digesting. The word ‘experience’ makes you wonder what you will be doing, doesn’t it? Hey, it is time for you to do some painting, too. Talk about a memorable vacation experience. The Ocean Explorer places you out on the water with a fishing rod. 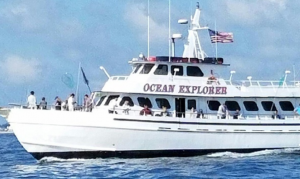 There are multiple opportunities for you to charter a fishing boat, and The Ocean Explorer is said to be especially good for those new to fishing. You will find most of the chartered fishing boat companies at the Belmar Marina off of State Route 35, and that is exactly where The Ocean Explorer is located, too. Belmar NJ is a beautiful, exciting and adventurous vacation spot. If you have been searching out the best destination for your next trip, Belmar could be the place. You will know where to go now, and who knows, you may not want to leave. You have been forewarned about the borough’s charm.